Have you ever wondered what to do with those chemical fertilizers you are never going to use? We don’t want to throw them in a landfill to possibly leach into our water supply, and we need them out of the shed to make room for this year’s organic amendments. For all those who live in Dallas or surrounding cities you may have an option. The Home Chemical Collection Center, sponsored by the City of Dallas and in cooperation with other municipalities is the place where your search ends. Other cities and metropolitan areas around the country should have a similar service. In our case, there were several out of date organic pesticides such as Bt, copper, Sabadilla and old organic liquid fertilizers. 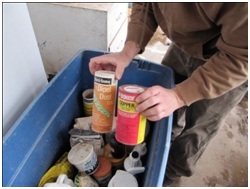 The Texas Organic Research Center had a few old containers of mystery substances that were no problem. The engineer pulled out a test strip to determine which bin to place them in and off to the processing plant they went. The Home Chemical Collection Center accepts all sorts of household chemicals, cleaners and electrical items, like that old box of used cell phones. For a complete listing of acceptable products and more information click here. To find a location near you throughout the United States click here. If you have any questions about this newsletter or any other topic, join me this weekend for my Green Dirt Doctor Radio shows.